What do you think of this Pig Pot Clip/Spoon Holder? • Keep stirring spoons off of countertops by sliding it into the silicone spoon holder. 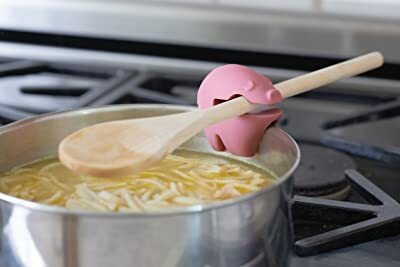 • These cute cooking companions keep your countertops clean and your spoons close at hand! • Made from heat-resistant silicone. • Less cleaning, means more time enjoying. Let this little piggy be your helping hand, she does her job without complaint…sitting on the edge of your pot while you work, holding your spoon until you’re ready to stir.